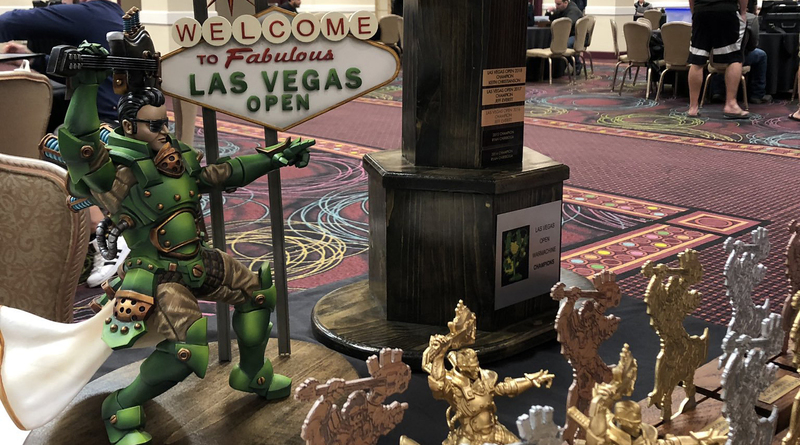 I had a blast this past weekend at the annual Las Vegas Open war-gaming event. As with last year, I was taking part in the Narrative tournament. There were a bunch of amazing armies on display this year! The narrative event itself was a lot of fun. Every game I played was fun, and I got to meet some great folk. 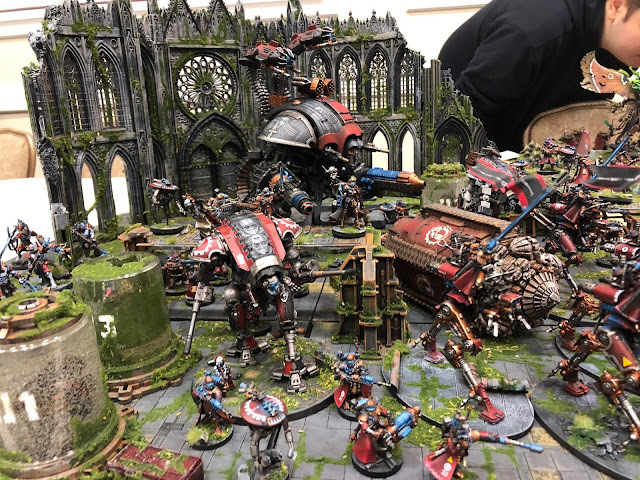 It was great to give the Corrupted Ad Mech a full run out, and it was encouraging to get so much positive feedback on the army. 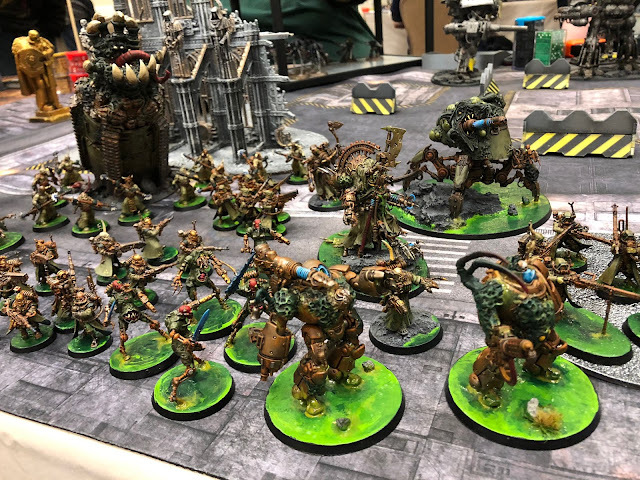 People really seemed to like the Nurgle theme, and I got a bunch of compliments on the conversions. I managed to win all of my games through the first two days, although I attribute that more to my partners than any inherent skill on my behalf. We played doubles games, and in each game my partner did an amazing job and honestly did most of the heavy lifting. 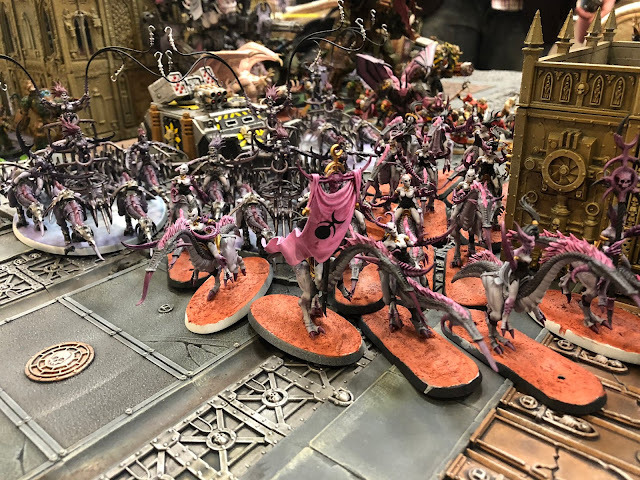 That said, I learnt how to use my army better, and was doing some great work with my Electro Priests in particular by the end of the weekend. 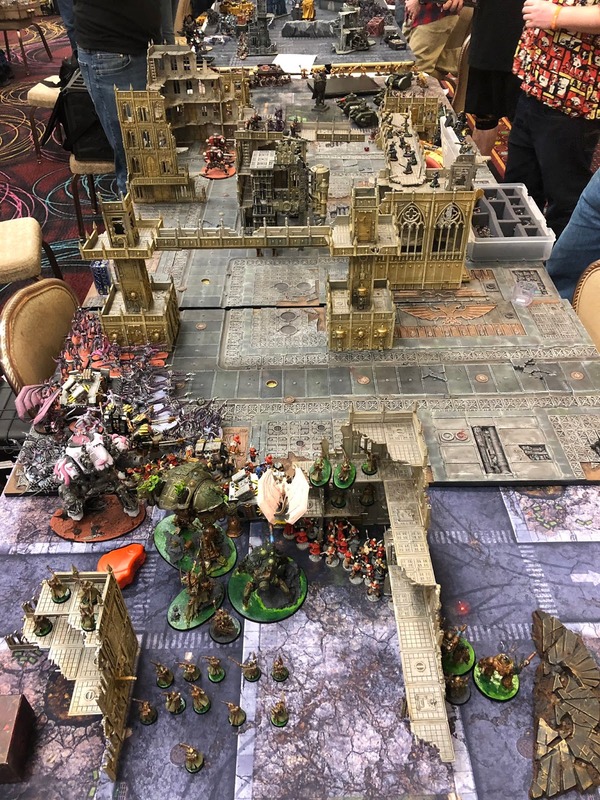 That all meant that I got to play on the final table on the Sunday, so was able to take part in the final epic climatic battle for the fate of the planet we were fighting over. 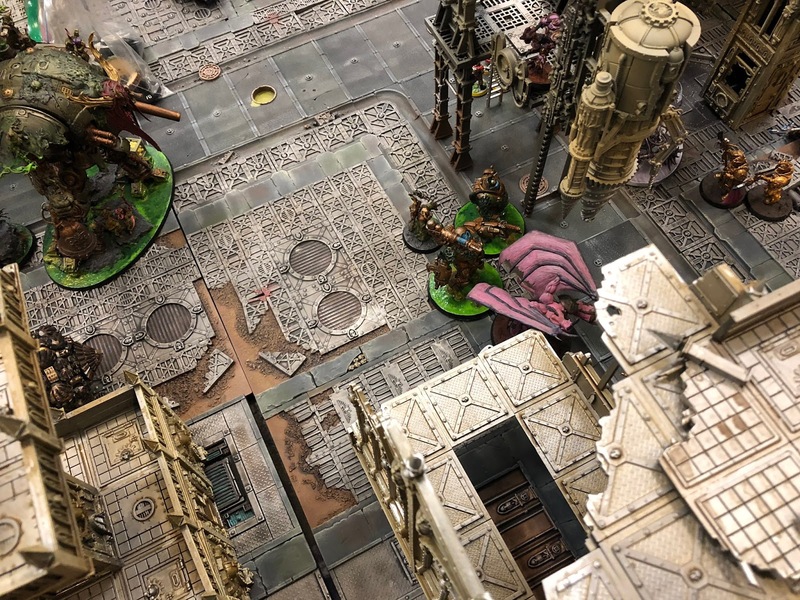 It was a massive 4v4 battle across a large cityscape. The events on the other tables then provided twists for our game at the start of each turn. Our forces of Chaos didn't quite succeed in turning the world into a Chaos World, and we ended up in a dead heat tie at the end of the climatic battle. 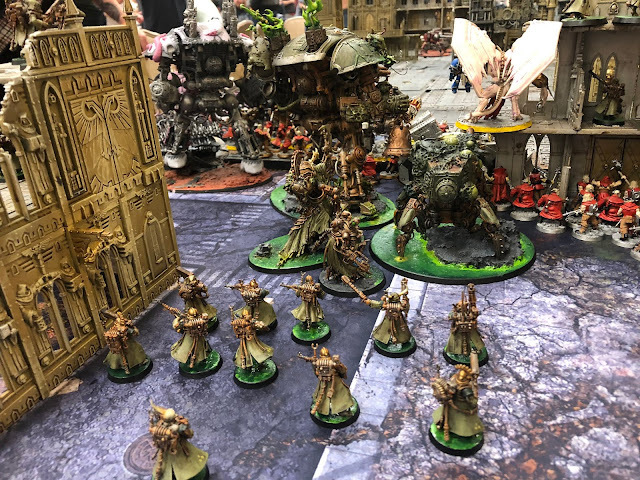 That resulted in the planets destruction, which isn't the worst result for the forces of Chaos! 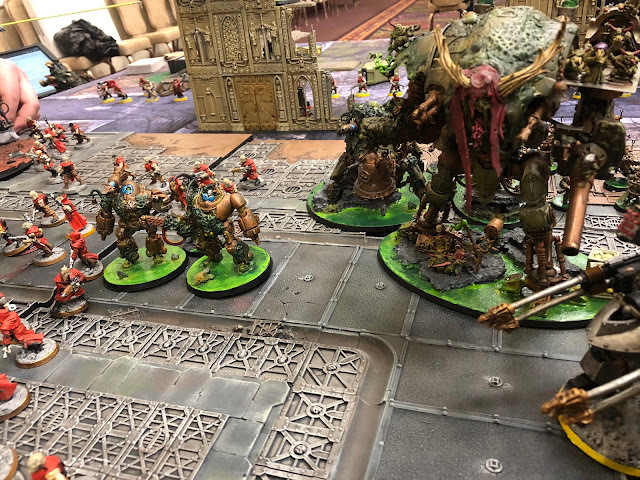 It went right down to the final dice throws in the final seconds of the final turn, so that was a pretty awesome way to end a fantastic event. Quite a few folk were talking about the strange dynamic that Lords of War exert on a casual narrative tournament like this. It's a tough balance for the organizers. 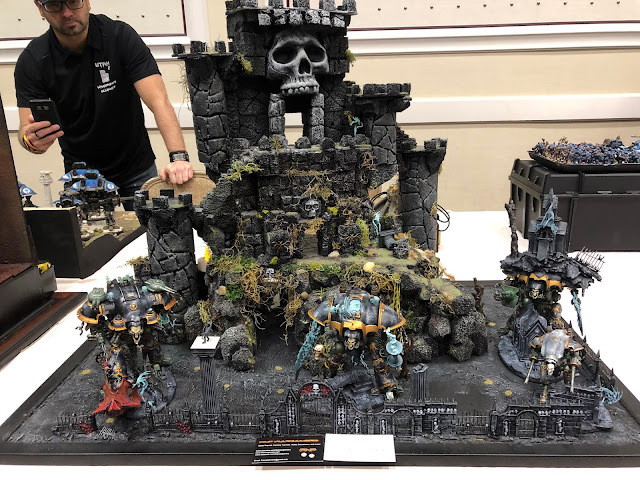 Since it is a casual event, you want people to be able to just turn up and play with their cool stuff, but also want to prevent games that are totally un-fun for one party. That will happen if they get overwhelmed by powerful Knights and other Lords of War their army simply can't cope with. Personally I want everyone to feel like they can play with their toys, but also think we all have a responsibility for the fun of everyone taking part. So I tended to have two lists prepared. One without any Lords of War, and one with, at each PL point. That meant that if someone wanted to play with all their massive units, or had an optimized tournament style list, then we could bring out the big guys and go toe to toe. Likewise, if an opponent couldn't cope with facing the big Knights or other Forgeworld shenanigans, then we could run fluffier lists, and make sure things were less likely to feel unfair. So for me, it's down to wanting everyone to have fun. In particular at a narrative event. Sure, even with balanced sides, some games can go badly for someone, but it's the spirit in which it happens that is important to me. I'll happily leave the knights in my bag (even though I was very proud of my converted knights!) if it meant we had a game that everyone was comfortable in. The challenge is that puts players who play only knights in a very tough spot, as it's hard to make a list that is composed entirely of Lords of War more palatable. It is however possible. 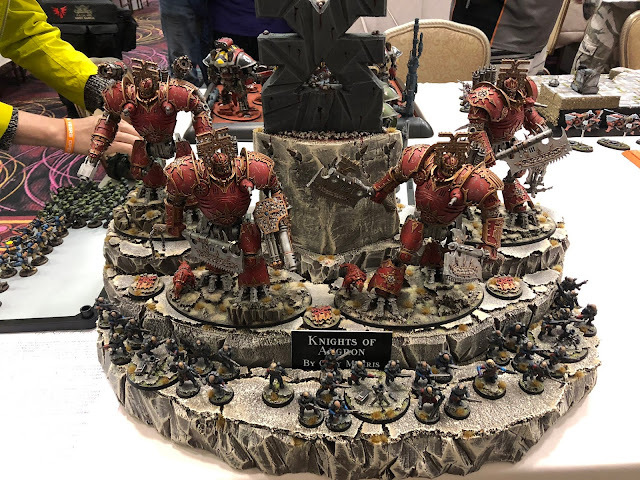 A Paladin is much more manageable for most armies than a Castellan for example, so I think Knight players could still be helping by tweaking lists a little to try to prevent their lists being too efficient. 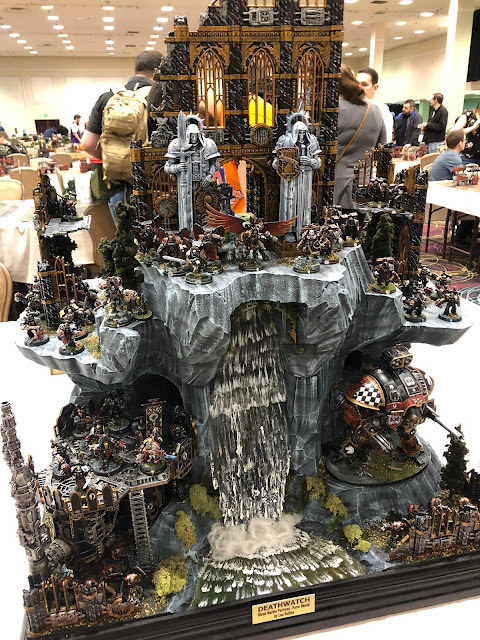 Maybe it's just my personal take on the hobby, but I would rather all parties have fun, even if it means deliberately nerfing my lists a little! Knights look cool, so I want to see them at events like this, but I do think we should all be part of making sure an event is fun for everyone taking part. The event was a lot of fun. Once again the Narrative team put on an amazing event, and the battles were all a lot of fun. I played a bunch of great folk, and enjoyed every game. Getting to play on the final table was definitely a highlight! Most importantly I got to meet and game with a bunch of great new people. I saw some amazing armies, and am already inspired a little to think about my army for next year!